Parents – we don’t like to admit, but sometimes we need something that will distract the kids for a little while. Whether it’s a long road trip that’s driving them (and you!) bonkers, or you just need a few minutes to finish writing that really important email, you just might find solace in this Jigsaw Puzzles app. 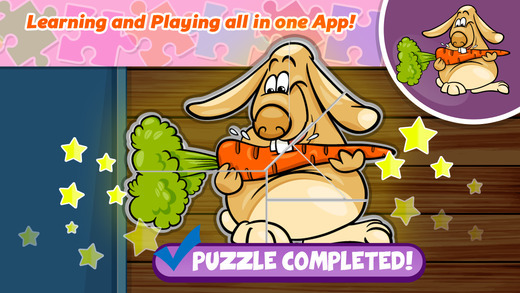 This fun app features 22 easy puzzles that will keep the little kids entertained. Geared at preschool age kids, these jigsaw puzzles are made of bright, colorful pictures with entertaining characters. Simple to use, the kids match up the pieces to the provided outline of the picture. There is also an image of the finished puzzle that they can use as a guide if they get stuck. Click on the pieces on the left and drag them over to the spot where they belong. If the piece matches up, it will automatically snap into its place! The pictures are comically drawn depictions of animals with some fruits and vegetables thrown in for good measure. Visually appealing and stimulating, young kids will enjoy putting the pieces of these puzzles together. 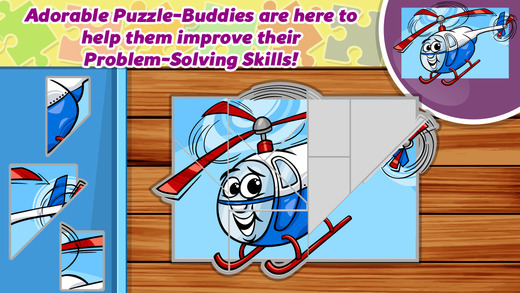 The puzzles are also kept at an easy level so that kids won’t lose interest before solving them. Jigsaw puzzles, even very simple ones, can be great educational tools for young kids. It works on hand-eye coordination, trial and error processes, and spatial awareness. Want to step it up a notch while having fun with your child? Make it a learning experience by naming what each picture is (zebra, monkey, camel), or mimicking the sounds that some of the animals make! For the parents, the settings section (which houses the sound control) has been childproofed with a simple math problem that needs to be solved before being able to access it. If you have a car ride coming up that might have the little ones saying “Are we there yet?” don’t hesitate to download this app today. Your kids will love it!